Sorry, picky Francophones, I mean M pour Montreal. There are less than two weeks until the annual M for Montreal festival fills the void in our life left behind by the once ubiquitous summer festival. On November 16th, Cafe Campus on Prince Arthur transforms into The Great Escape stage and the fest will kick off with performances by CLAASS and Duchess Says, two local bands tipped for big things and coming off of successful summer tours. As my fellow insomniac festival goers will be pleased to hear, the M for Midnight shows are also making their grand return that night, with dreamy alt-rock from Lena Deluxe and Ed Wood Jr. at L’Escogriffe on Saint-Denis, while Lack of Sleep (appropriately) and I.No hit the stage at Quai des Brumes just down the street in a showcase presented by La Marmite, an arts and culture initiative from the north of France. Then on Thursday November 17th, things get a little loud and a little soulful with Leafer and Marième at Quai des Brumes. Metalheads, they’ve got you covered, too – at L’Escrogriffe, Les Productions la Bête Rouge present M for Metal! At the stroke of midnight, come check out Trigger Effect and Barn Burner tear this tiny dive bar apart and do your best not to sustain any neck injuries. This summer, I had the chance to catch just one of M for Montreal’s many travelling showcases while in Toronto for North by Northeast. 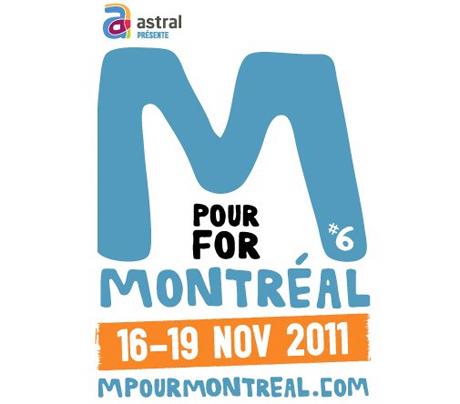 M on the Road is a year-round effort to bring mostly local bands all over the world to hype of the festival and also represent the Montreal scene. Incidentally, they’re in Paris as I write this, getting ready for a show featuring Braids, Karkwa, Jimmy Hunt and Ensemble in the heart of Montmartre. They’re also just coming off a crazy successful week at the College Music Journal Awards in New York City – where your campus station, CJLO, cleaned up alright with Omar Husain nabbing the coveted Music Director of the Year prize. Anyway, after watching Ty Segall and Uncle Bad Touch play in the hull of a ship sailing around the Toronto harbour (amazing, right? ), I’ve been understandably impatient for the last few months, waiting to see what else the amazing staff behind the festival have in store for us. Despite how sad and bitter I will most likely be on the last day of the festival, it’s actually the showcase I’m most excited for. Closing out the 6th edition, local promoters Blue Skies Turn Black will team up with Metropolis to host performances by Marie-Pierre Arthur, The Barr Brothers, Ariane Moffatt, Random Recipe, Galaxie and Karkwa. If you have a chance, be sure to also check out Creature, Doldrums, Adam & the Amethysts, Jesuslesfilles…all of it. Actually, just go see all of it.